The pitch shift function allows you to change key 6 semitones up or down. As with ANY pitch shift engine, not just ours, vocals can be shifted up or down a lot less than the instruments before they start to sound unnatural. Therefore if you are using key change AND leaving the vocals in we’d recommend not going further than 2 semitones higher or lower. That said most churches using the key change function use it to suit their own lead singers’ vocal range so are likely to mute the vocals anyway. Do also bear in mind that to keep a song congregationally singable you probably won’t need to pitch any song more than 3 semitones in either direction. The tempo function lets you double or halve the speed of any song. Faster will of course push the dynamic a bit and slower is great for learning song parts but one word of caution… We tend to find lots of churches play worship songs simply too fast in an effort to make the song dynamic more exciting. Do be careful with this as not only does it make the song more difficult to sing but it can lose some of the emphasis in the theme and lyrics. Listen to a pro band playing worship songs and they’ll often play them a lot slower than you think. Brenton Brown plays the song ‘Lord Reign in Me’ slower than anyone I’ve ever encountered – and he wrote it! The key to keeping the dynamic up without the speed is to play with confidence and lock tightly into the groove. Less notes, better timing, more authority. One more tip – the save song mix and tempo are independently reset so if you reset the tempo you still need to hit the save song mix button afterwards otherwise the next time you play the song it will play at the previously chosen tempo. The vocal cue stem is designed to give you prompts for count-ins, endings, hard to remember lyrics and band cues for the structure and arrangement of the song. If you don’t want the congregation to hear it, simply use the stem’s left/right volume slider to set up two mixes, one for the congregation through one side of your stereo output and the other side for the band. I.e. use a splitter cable from your computer’s headphone output into two channels of your church mixing desk. Then drop the stems volume slider to 0% on the congregation’s channel and boost or cut the volume on the other slider to taste into the channel that goes to the band’s fold back. It goes without saying that setting up and saving a song mix should be done well before you use it live in church. Most people mute the instruments stems they have playing live – but do try experimenting with leaving the some of stems unmuted that you have playing live but at a lowered volume level – e.g. 20%. Then have the live players exactly mimic those parts and it can add some real fatness and depth to the overall sound. Also if your congregation has trouble keeping with the timing try boosting the level of the drums and/or boosting the treble in the mix on your church sound desk. The treble frequencies will help bring out the top end and snare of the drums which in turn will give both congregation and band timing cues. If your team aren’t used to playing with a backing track or click do be aware it needs much more practice than you might think! Most of us think we’ve got a pretty good sense of time but you’d be surprised how easily most musicians fall ahead or behind the beat if they don’t practice to a click. 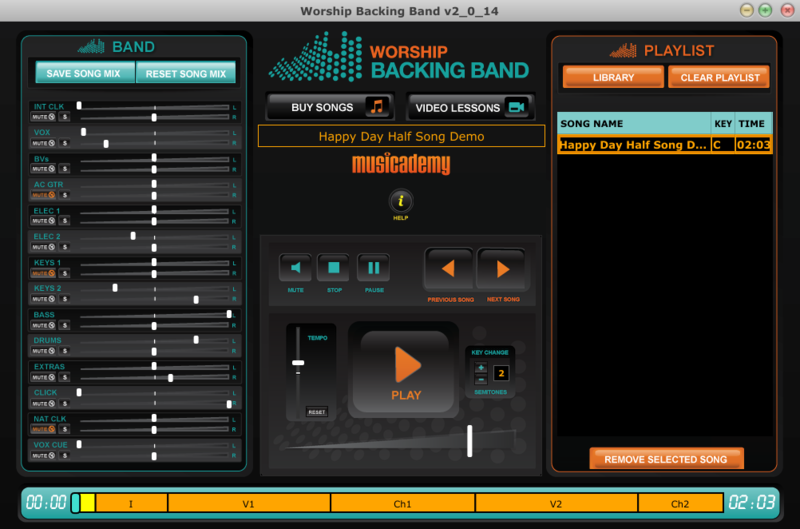 So in short do try it lots in rehearsals before you use backing tracks live with a band in a service. Do experiment with boosting the click stem level if there’s lots of stage volume or especially if you have any older musicians who have lost some of the top end frequencies in their hearing. Research suggests this starts to happen to all of us from around age 30! If you want to learn or practice a specific section of a song you don’t have to start from the beginning of the track. Simply use the < > keys on your keyboard to scroll to the desired section and hit G key (for go) and the song will instantly play from that section. As with learning any new part, make sure you practice it way more than you think you need to – both individually and collectively as a band! The player any musician or sound tech but its primarily designed to be used by a worship leader or musical director whose probably playing an instrument. I.e. no spare hands! Therefore once you’ve set up a song mix and playlist all you need to is hit the spacebar to start each song (remember its automatically cued up in the playlist anyway). If you’d rather use a footswitch to start the song instead try using any keystroke based foot pedal designed for gaming. Gaming footpedals generally come with a small piece of software that allows you to very simply ‘tell’ it which key strokes you want the footpedal to trigger. So setting it up to trigger the spacebar will give you total hands free operation. Gaming foot pedals are readily available online – try Ebay or Amazon.